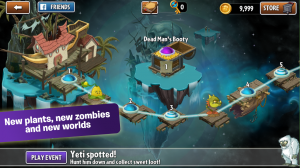 Plants vs. Zombies 2 has a big update! 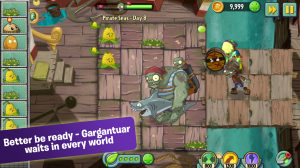 Plants vs. Zombies 2 has a big update on the Play Store. This is one of most downloaded games of the year but the users have been complaining about some details. Pop Cap has taken into account all the suggestions and complains and it has just released a highly improved update of this addictive game. The extent of the update in not sufficiently highlighted on the description published on the Play Store. The main criticism has been focused on the difficulty obtain the keys to advance through the map, something that you can only obtain after long time playing or via in-app purchases. In this new version, the map becomes linear and no keys are needed, so the progression will be quicker and easier. If you still have some unused keys save up, the game will automatically change them by coins. The stars controlling access to new worlds have also disappeared, and you will move on to the next world once you have finished all the stages. A little drawback with this new map is that you may need to unlock again some parts that you have unlocked before. This is due to the fact that all the sections have been integrated into a single path. And unlocking them is going to be harder this time, because a new big zombie is here. The Gargantuars are going to add an extra level of difficulty. 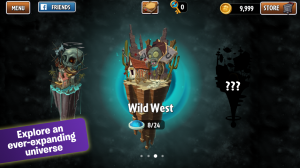 There is also a new world set after the wild west one. From the imaged provided, it looks like a Sci-Fi world. Pop Cap has also add some new features like the possibility to invite friends and send them gifts and the turbo button, which allows you to speed up time and avoid the first boring minute of each scenery. You can find the game on the Play Store.